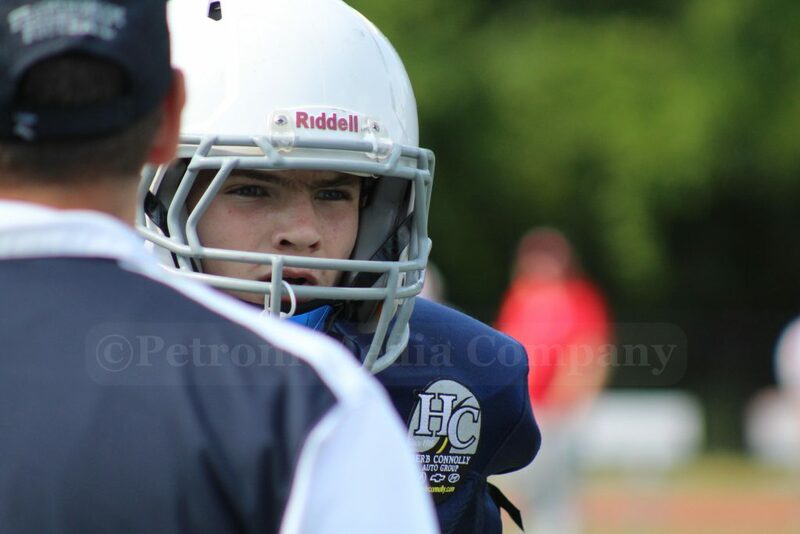 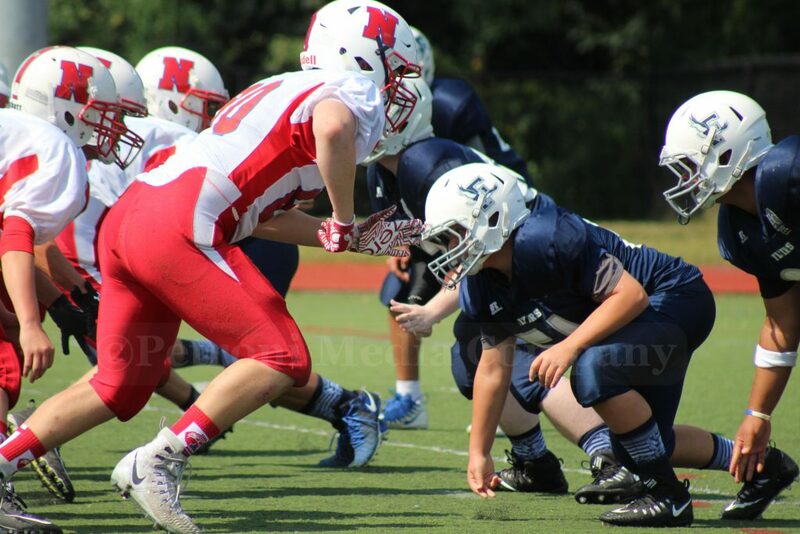 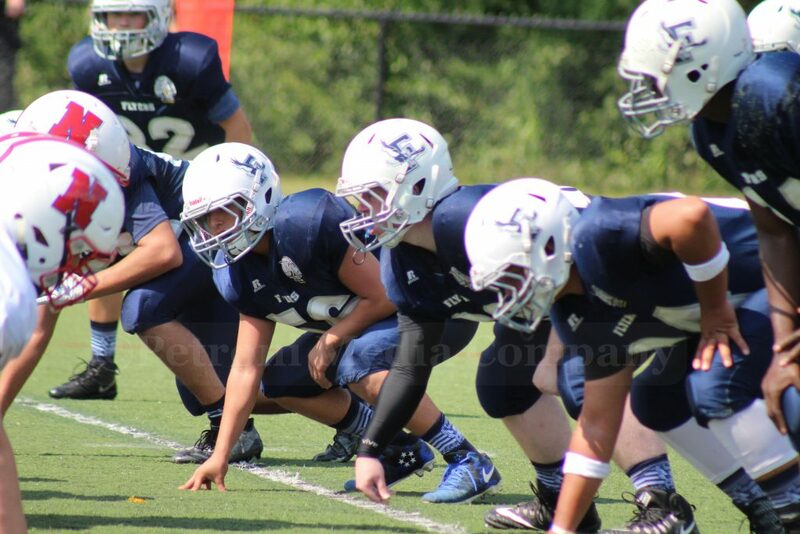 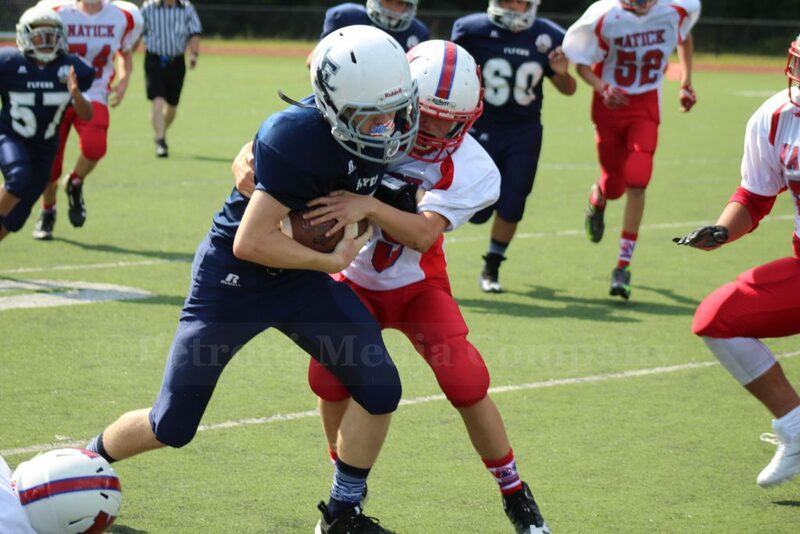 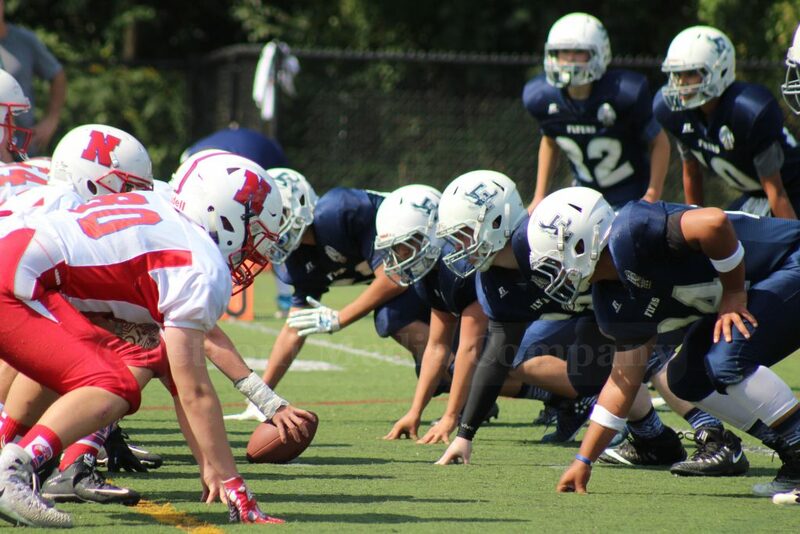 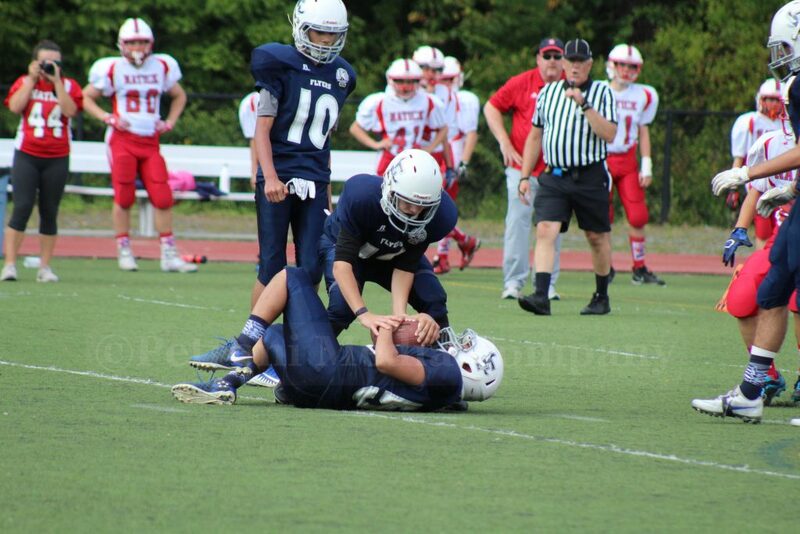 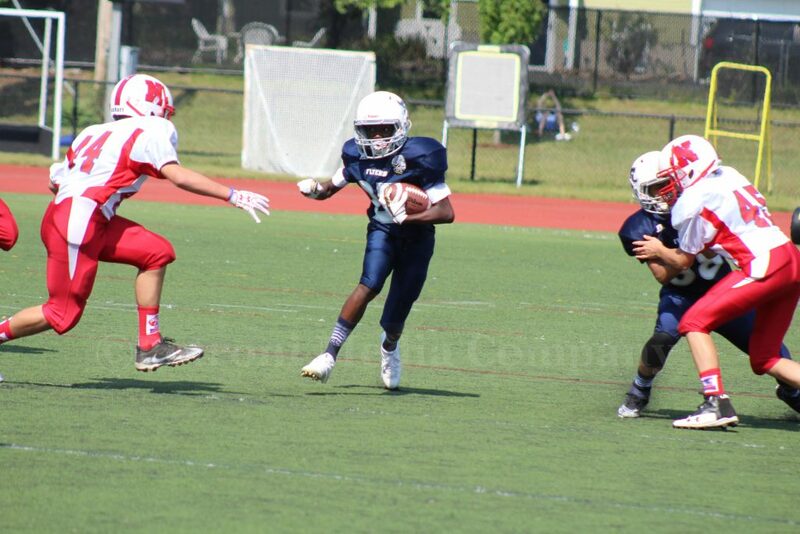 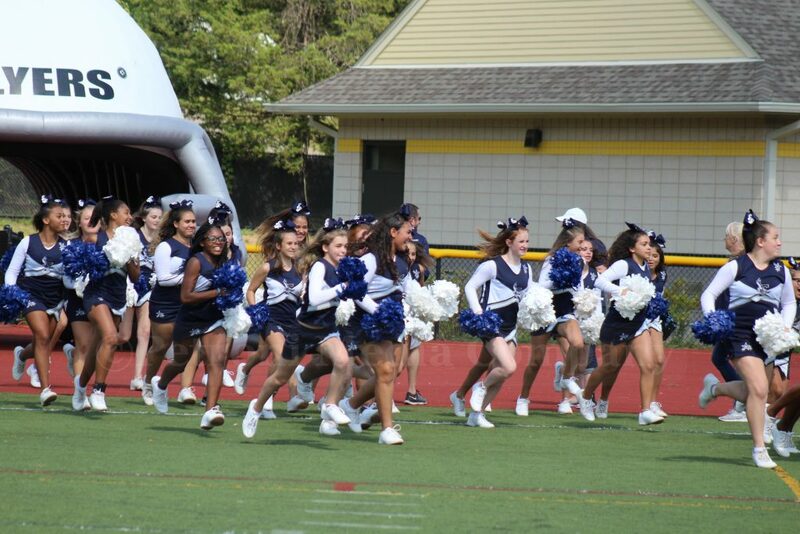 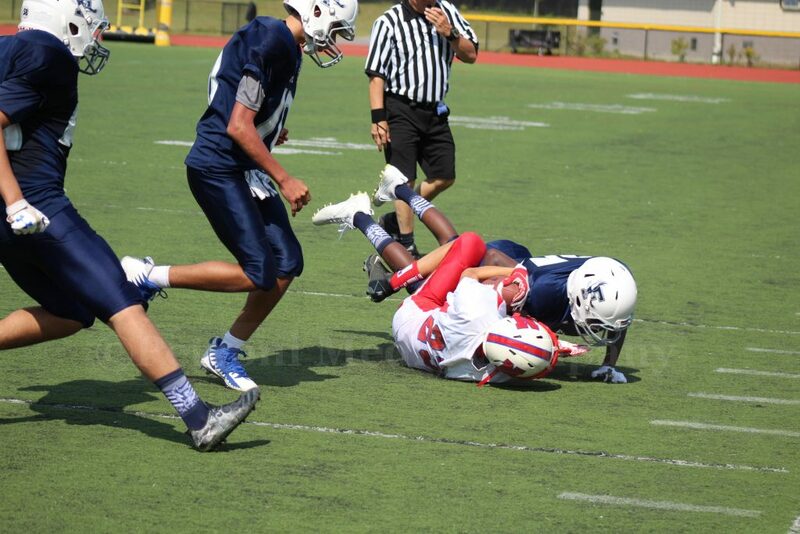 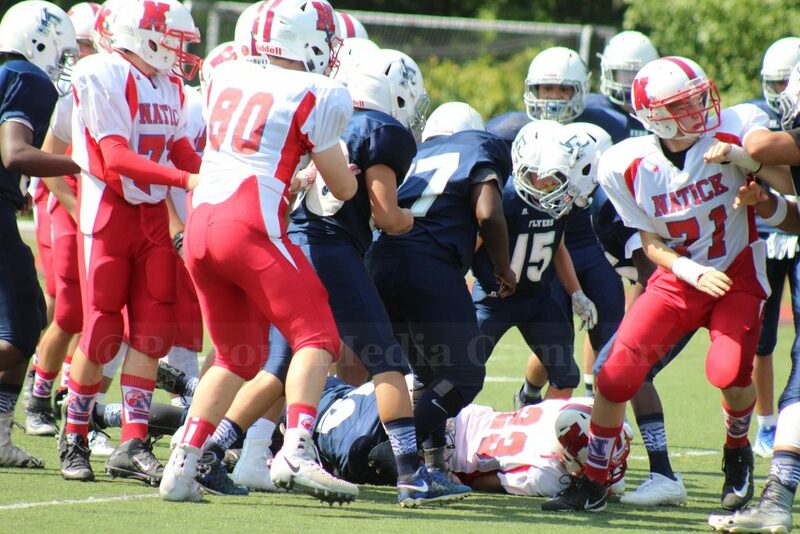 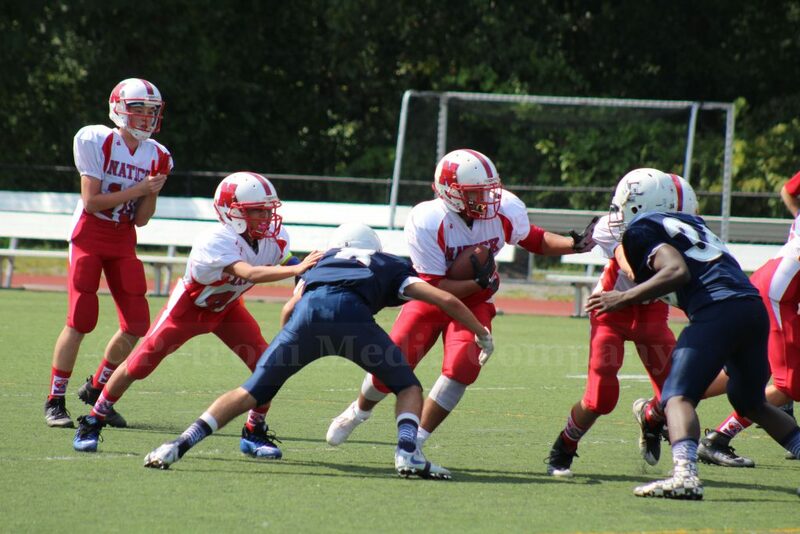 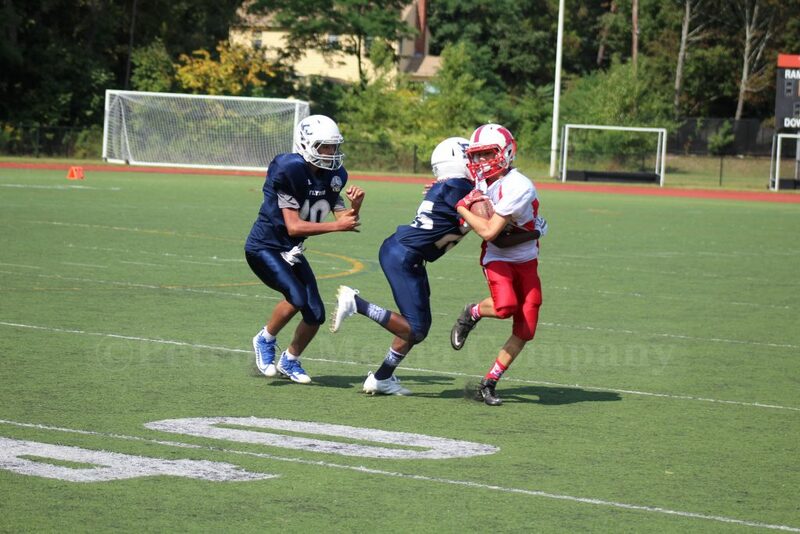 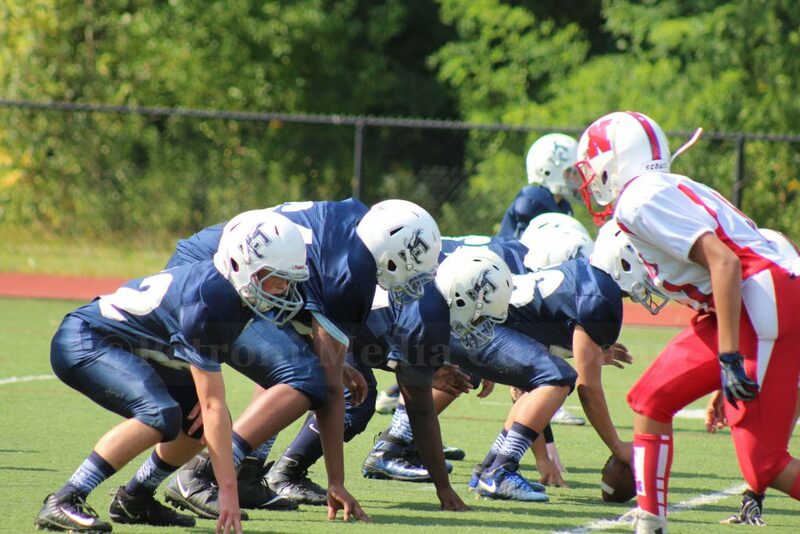 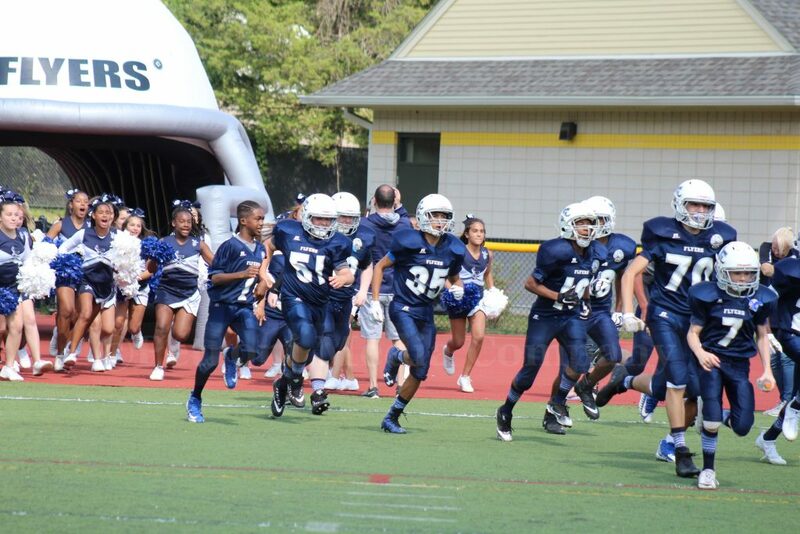 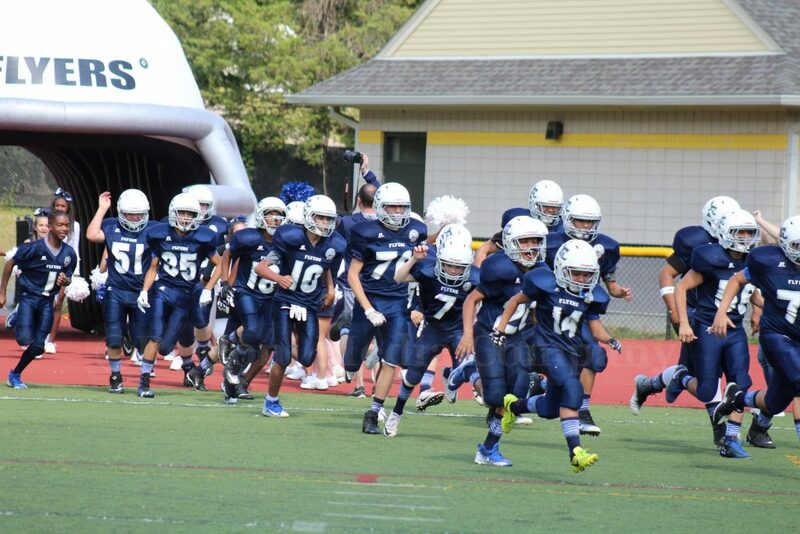 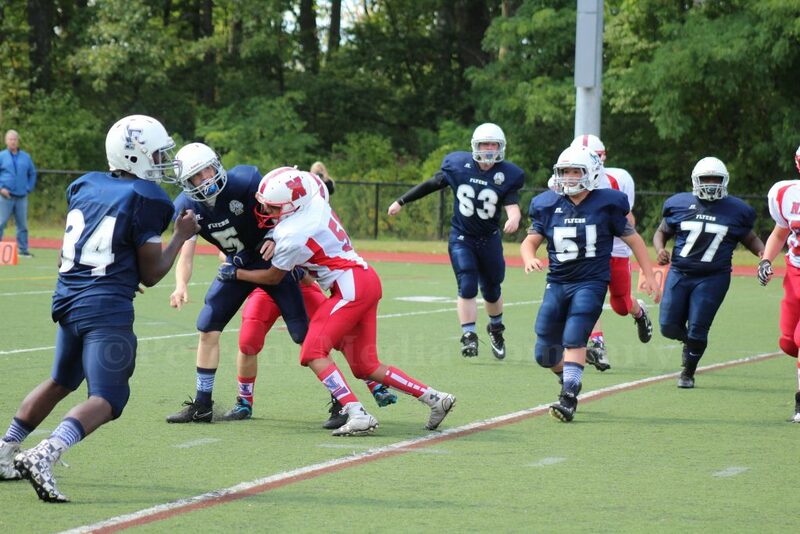 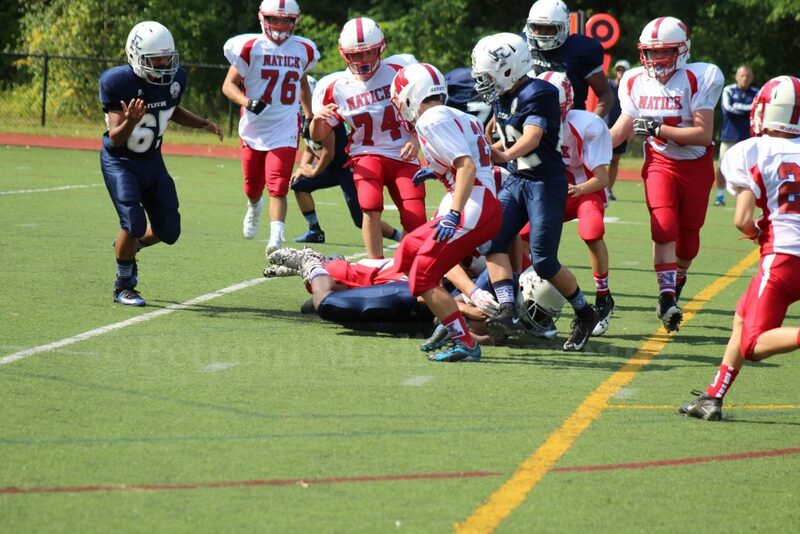 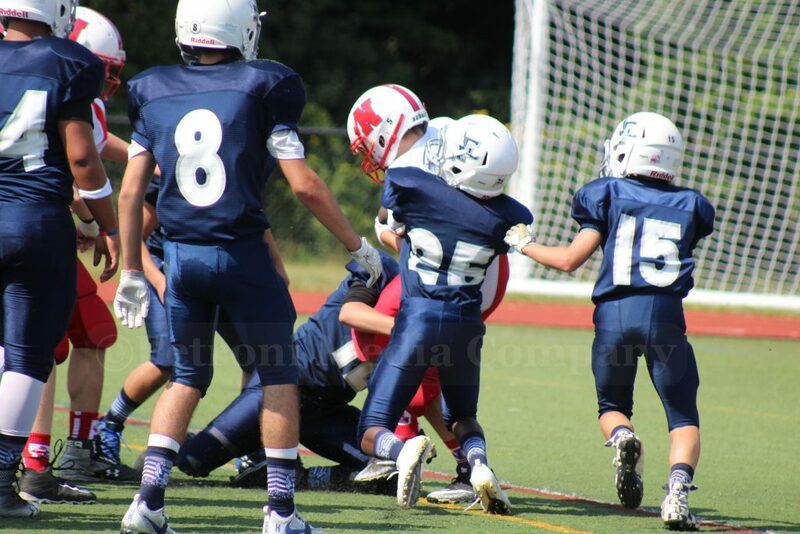 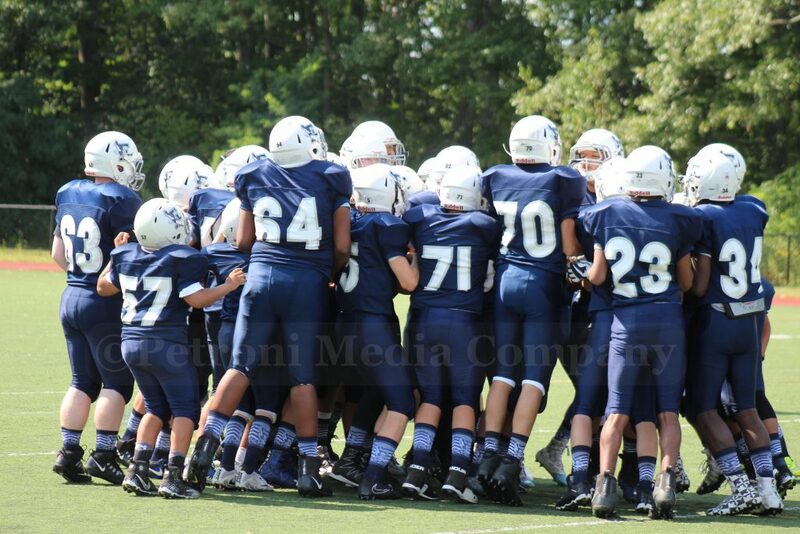 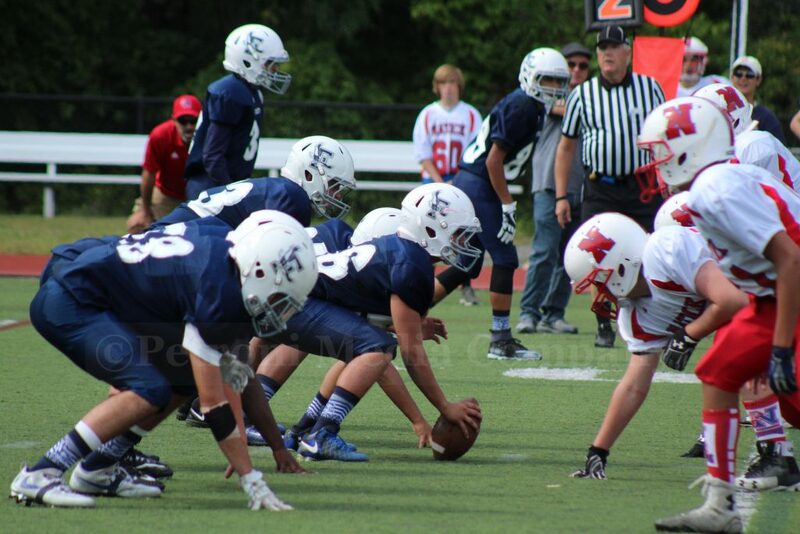 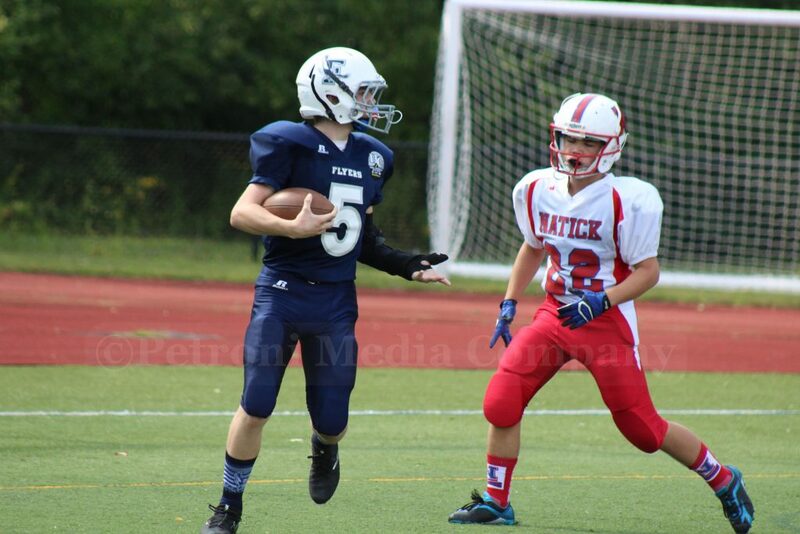 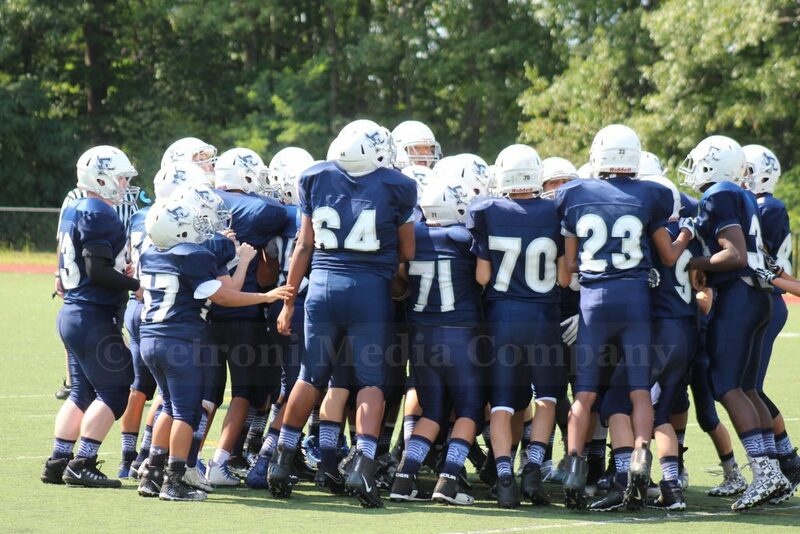 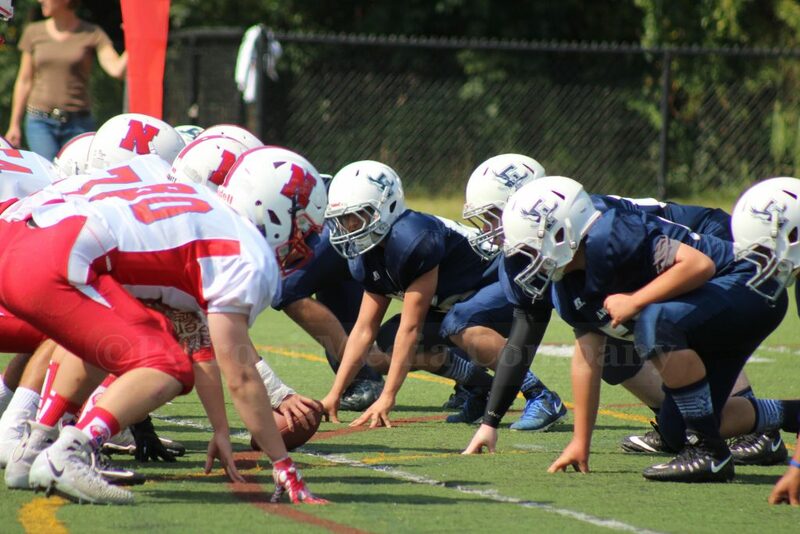 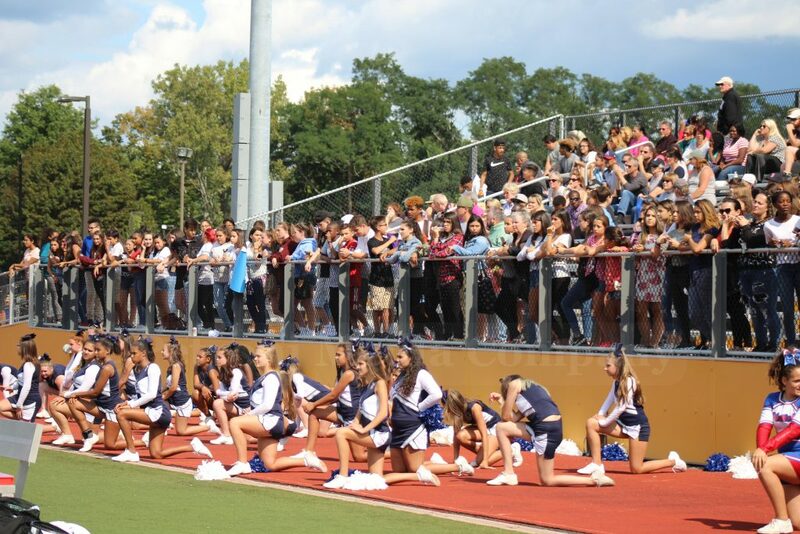 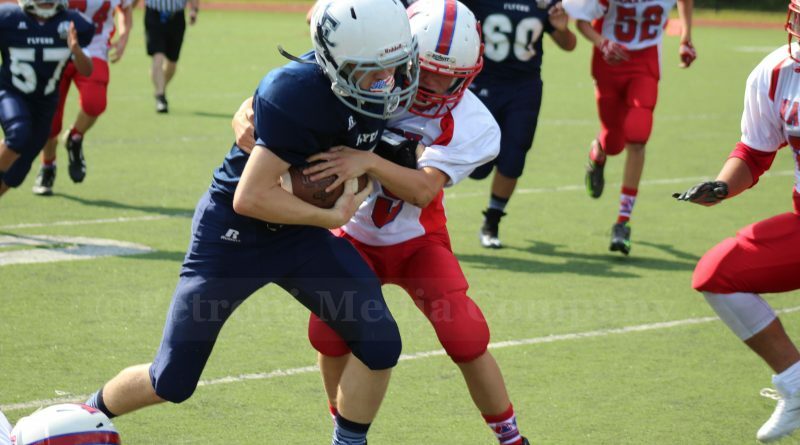 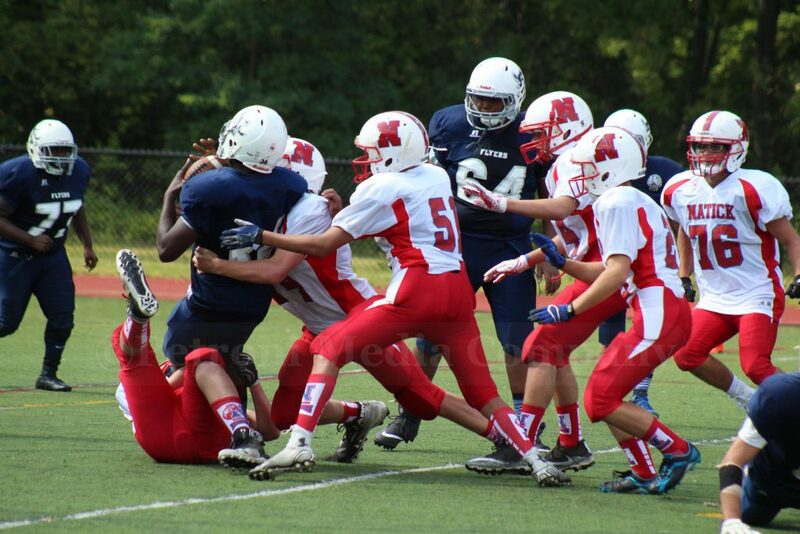 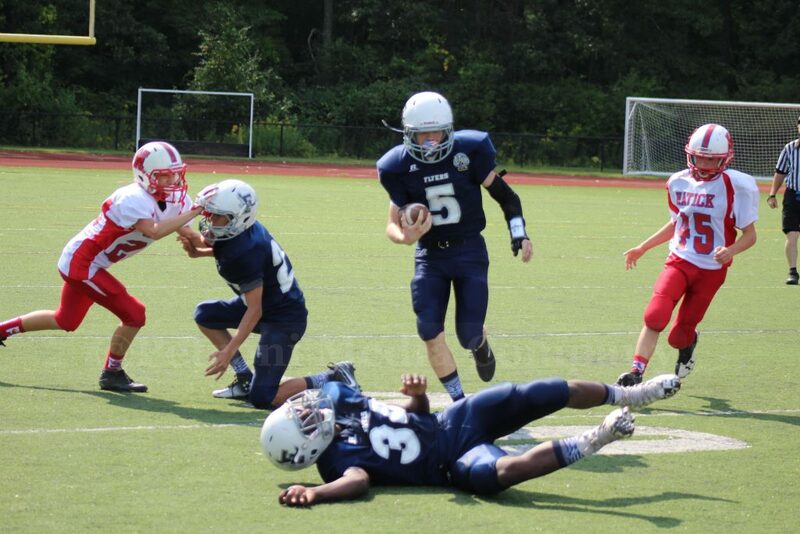 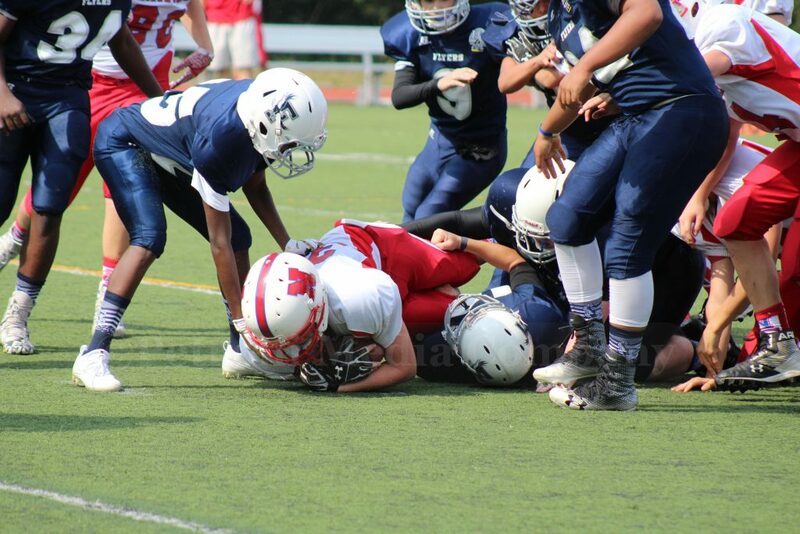 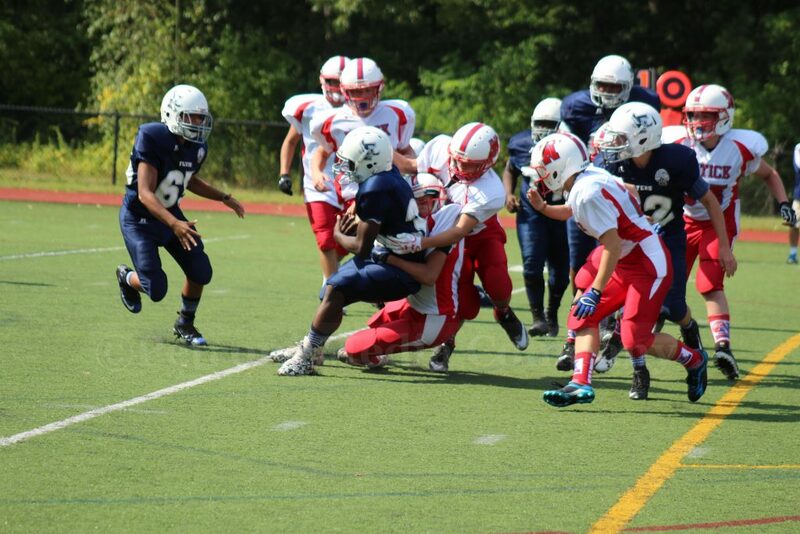 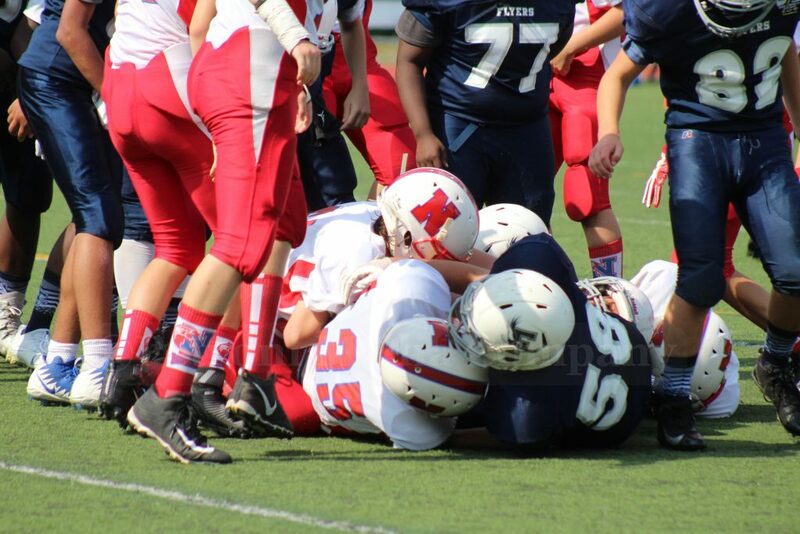 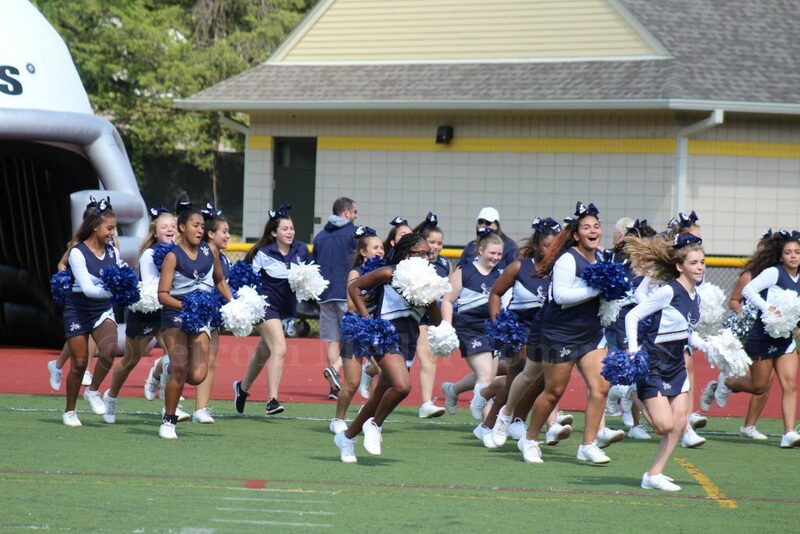 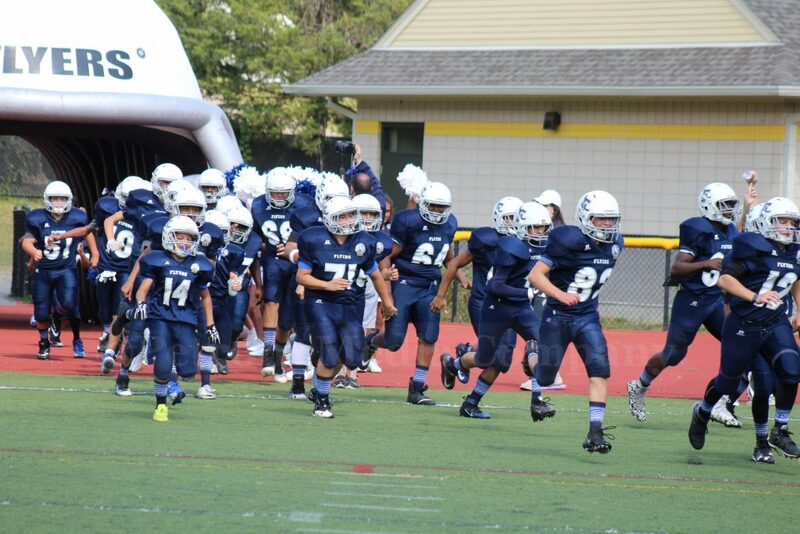 FRAMINGHAM – Fresh off of a dominant win against Norwood, the Flyer 8th grade football team looked to keep their record perfect with a win against the Natick Redhawks at home. 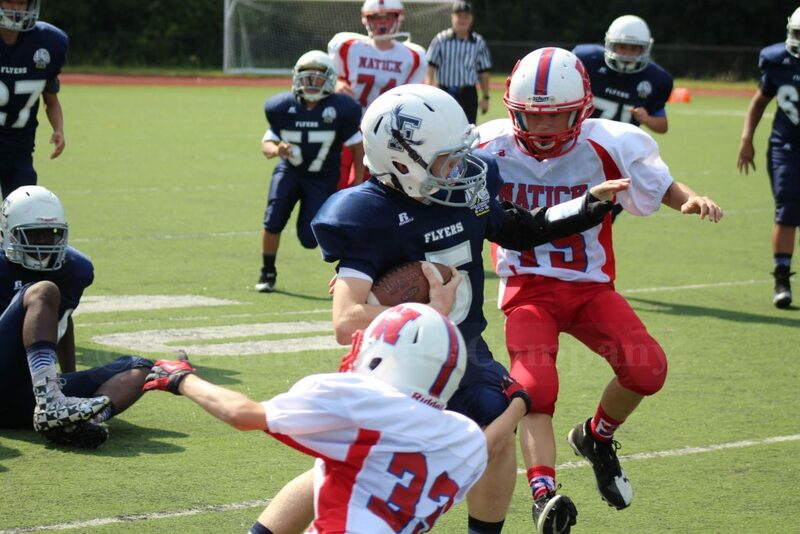 However, this game turned out to be a tough challenge for the talented Framingham squad. 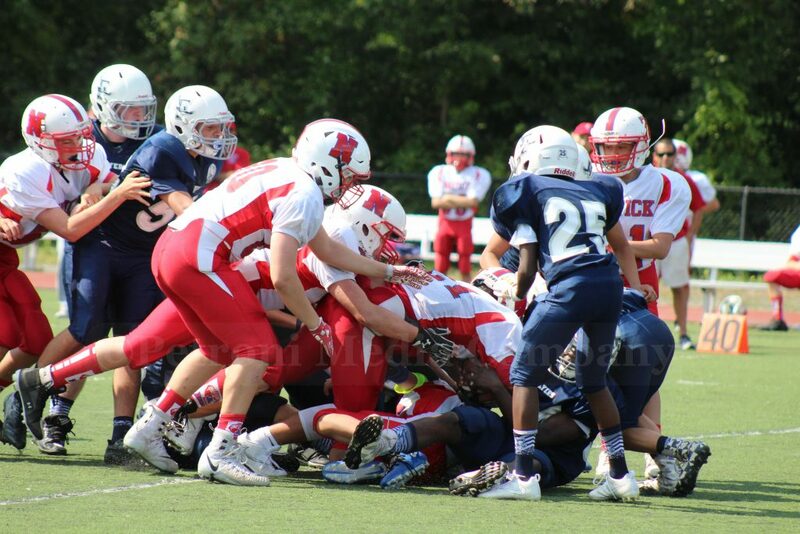 Natick opened the game with an up-tempo offense, leading a quick no-huddle drive to the end zone that gave them a 6-0 lead. 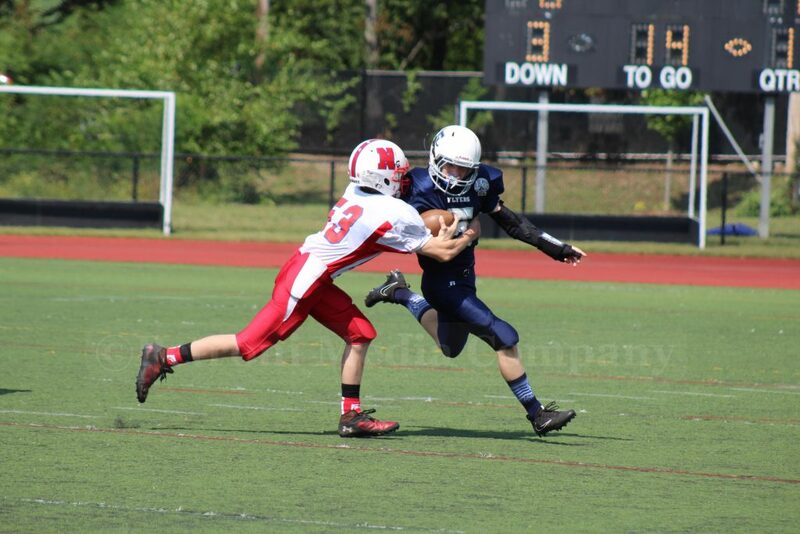 Framingham couldn’t answer this touchdown on their first offensive possession, but the Flyers made up for this with a great defensive effort on Natick’s next drive. 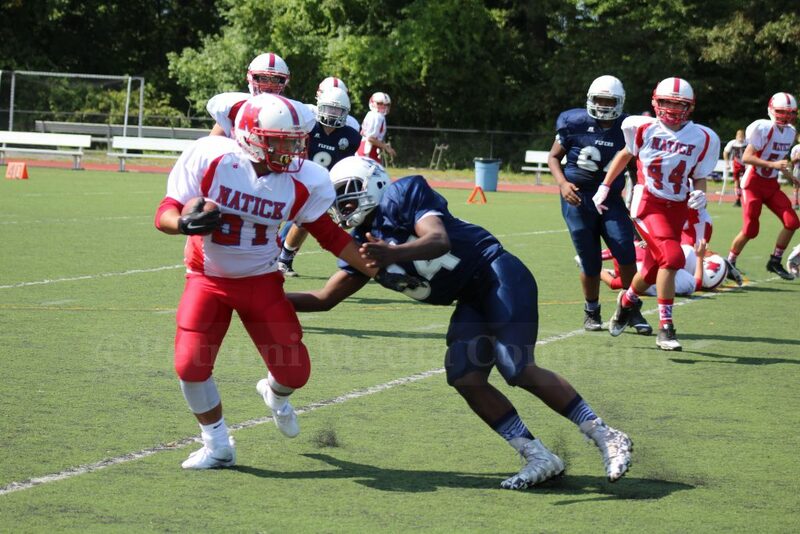 Great tackles by Zach Semakula and Rodrigo Ramirez as well as a huge sack by Kevin Rodriguez forced Natick to punt as the first quarter came to a close. 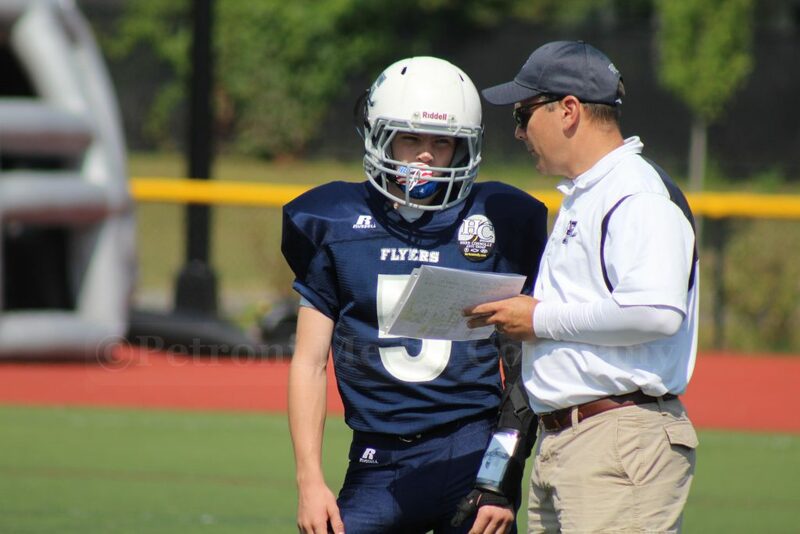 The Flyers aimed to tie the game when they got the ball back to start the 2nd quarter, but Natick’s deep punt forced them to start their drive from their own 5-yard line. 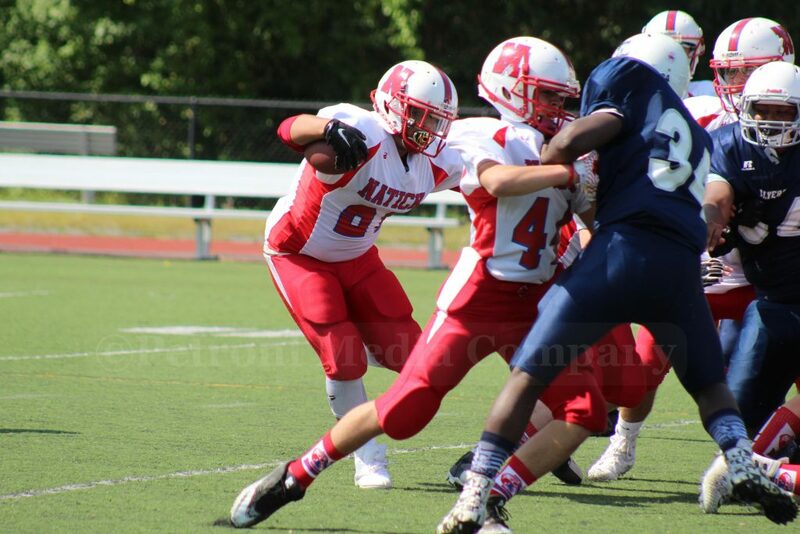 The Redhawks immediately put pressure on Flyer quarterback Cody Coleman, hoping to force a safety, but Coleman used his agility to escape Natick’s pass rush and ran for 25 yards. 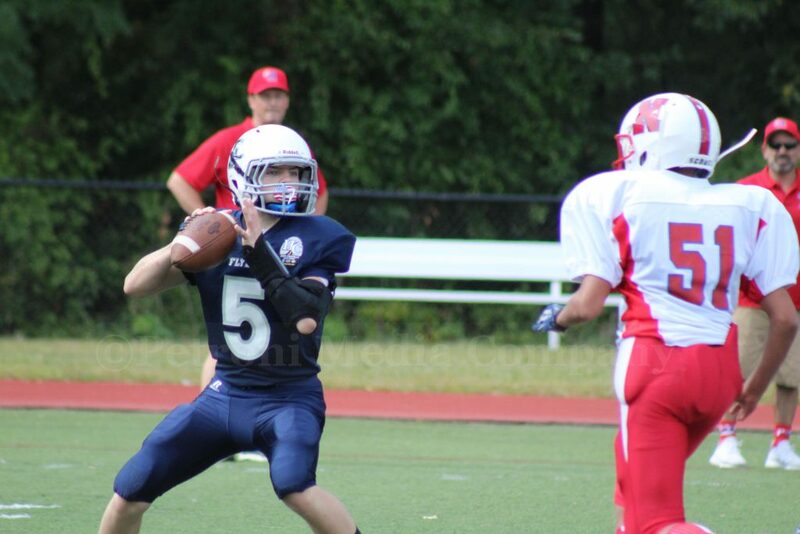 Unfortunately, this promising drive ended quickly when Natick intercepted the next Framingham pass and returned 30 yards for a touchdown. 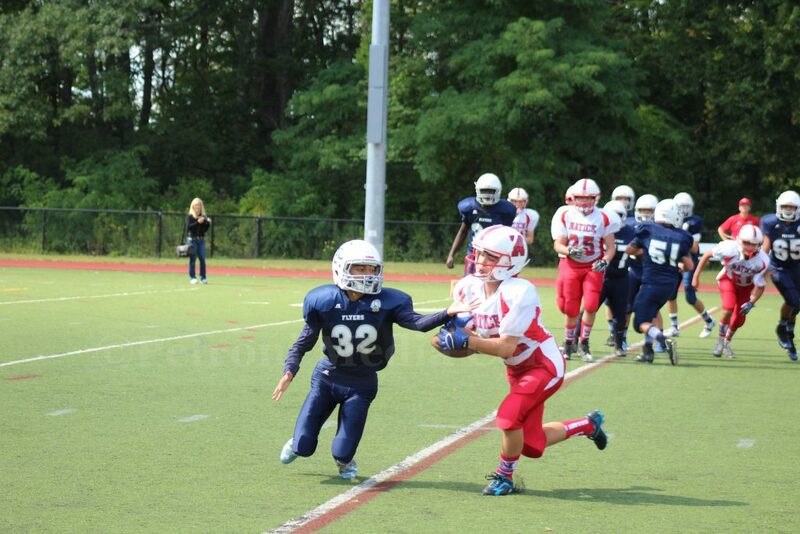 Later in the second quarter, the Redhawks added 6 more points to their lead on a 35-yard touchdown pass up the middle of the field. 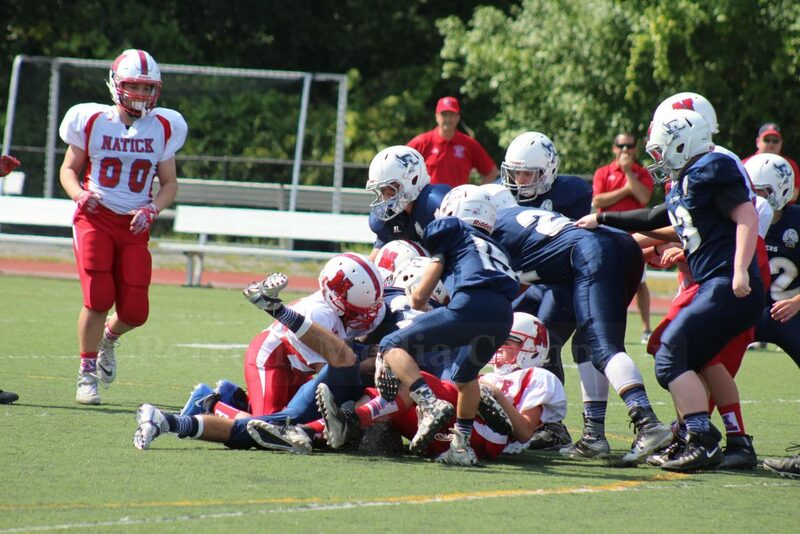 At the half, Natick led 18-0. 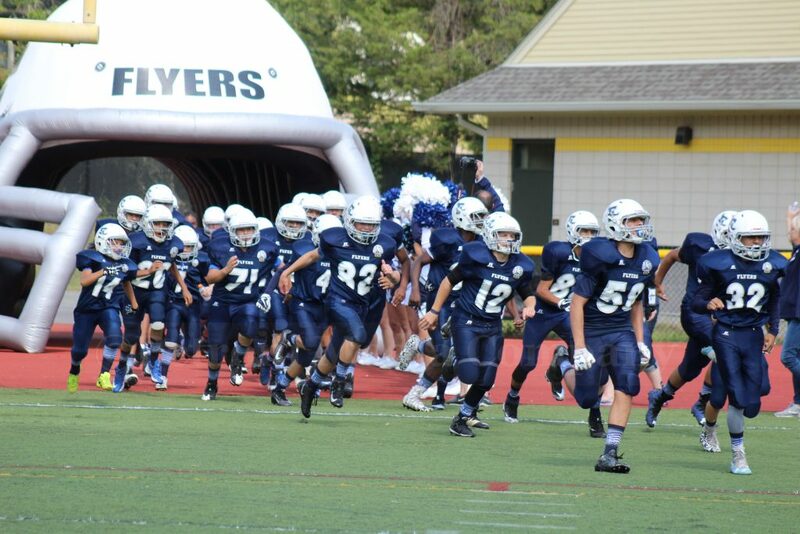 Framingham looked like it was about to storm down the field during its first drive of the 2nd half, but the Flyers were eventually stopped at their own 40 yard line and turned the ball over on downs. 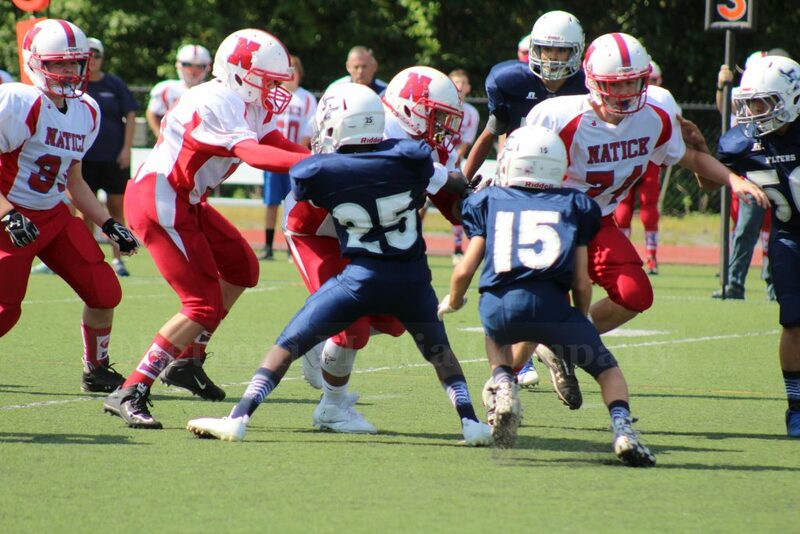 Natick was able to capitalize on this turnover on the very next play with a 40 yard touchdown run, extending their lead to 24-0. 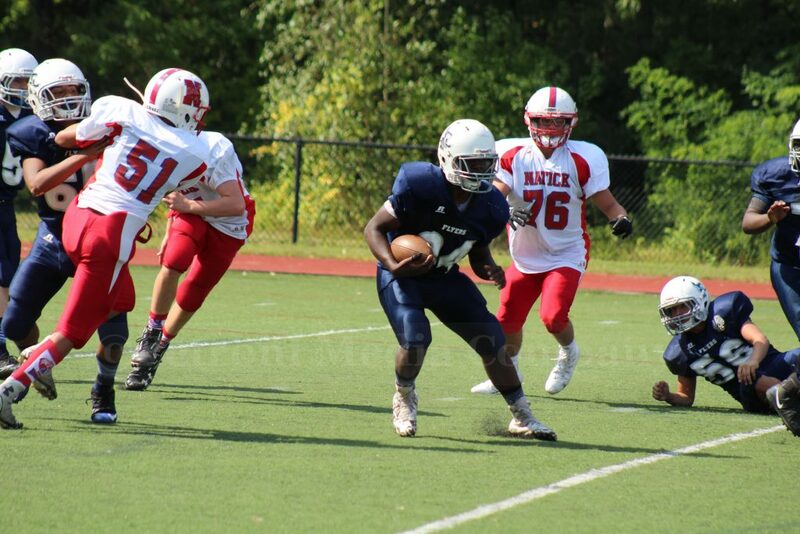 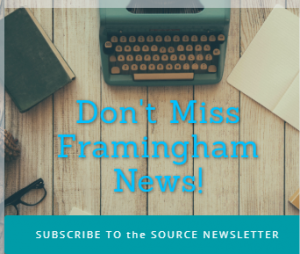 Framingham continued to show flashes of brilliance on offense, including several long runs by Coleman and a 22 yard pass from Coleman to Tim Sullivan, but the team could not manage to put all of these big plays together into a scoring drive. 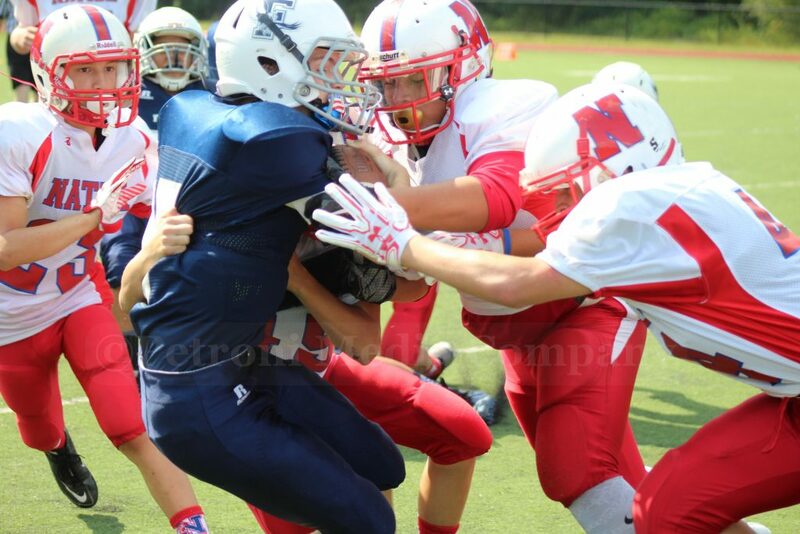 However, Natick kept on rolling and added a fifth touchdown to the scoreboard late in the third quarter. 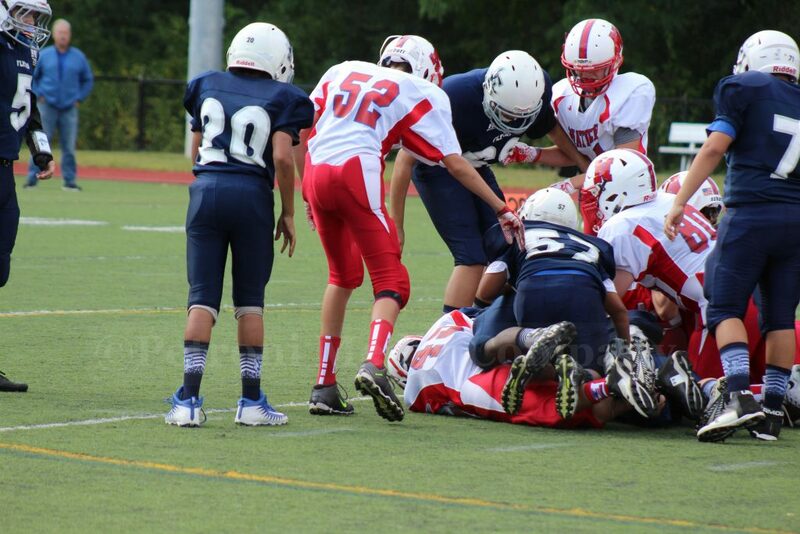 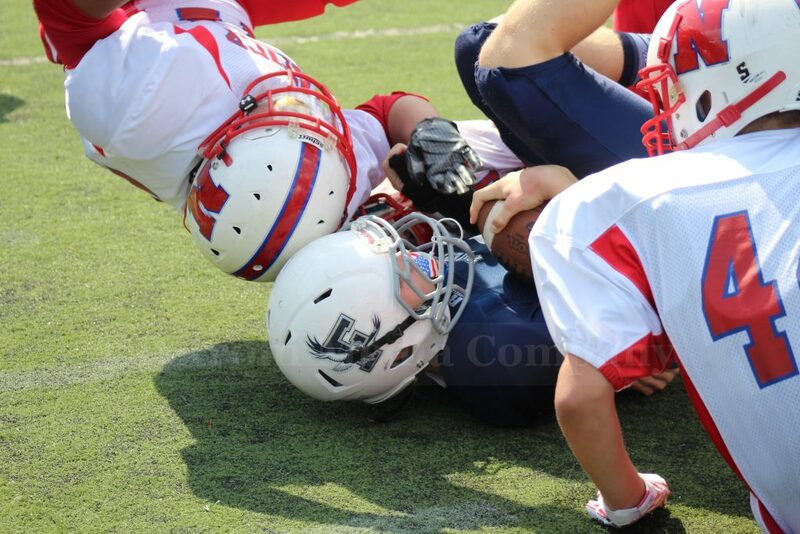 Neither team reached the end zone in the final quarter, and Natick emerged victorious by a score of 32-0. 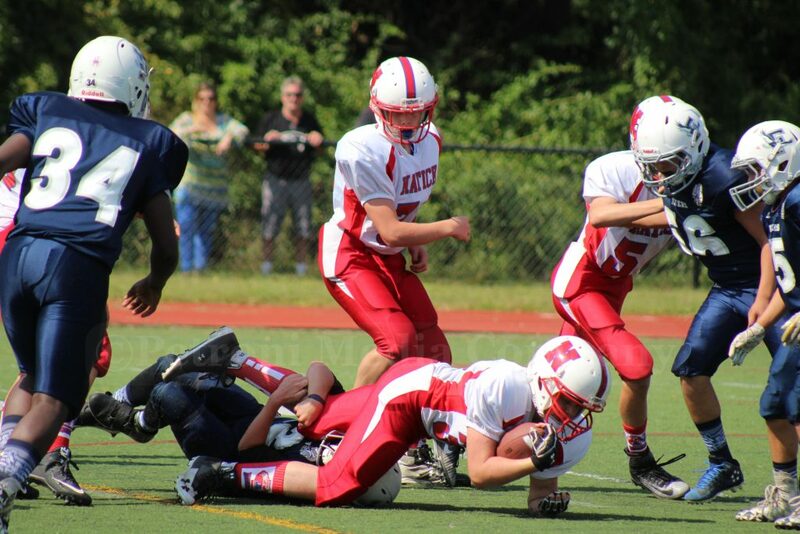 Despite the tough loss, the 8th grade team is still 1-1 and has the opportunity to get back on the right track next weekend at Needham. 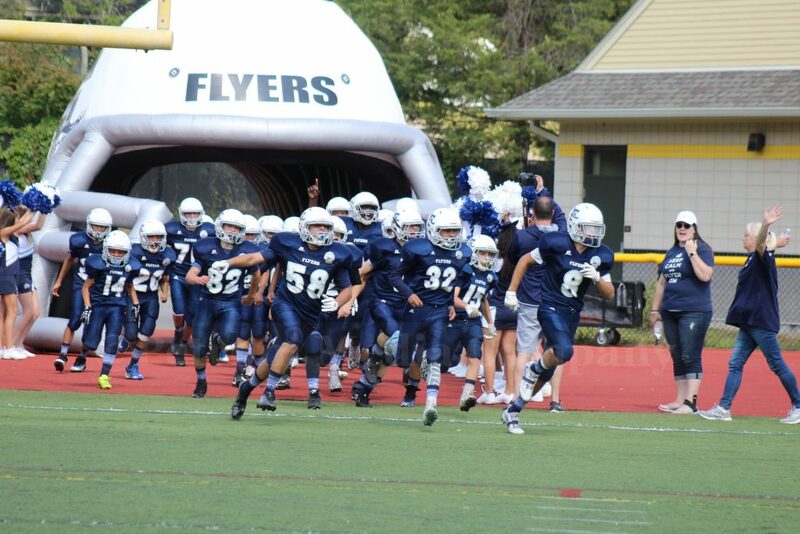 Instead of the usual Sunday afternoon game, the 8th graders play Saturday night under the lights. 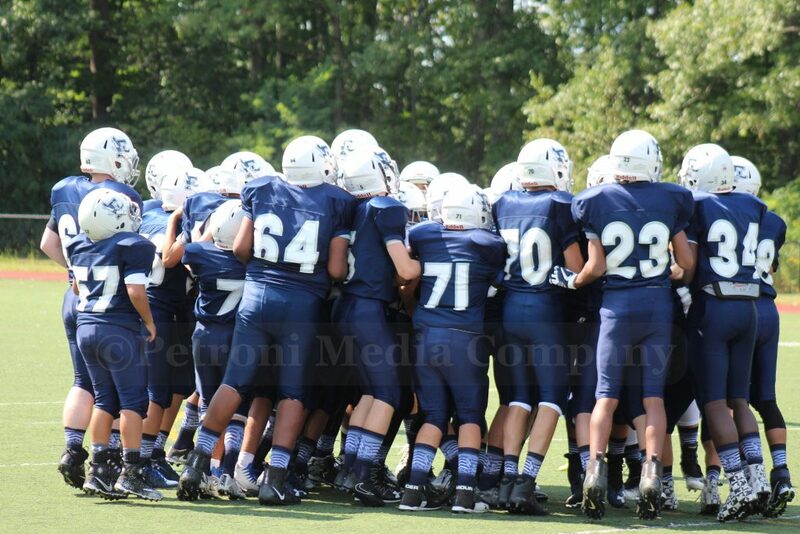 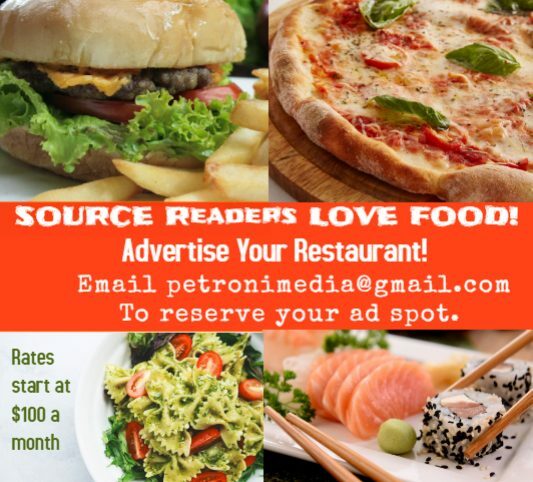 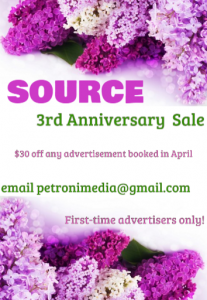 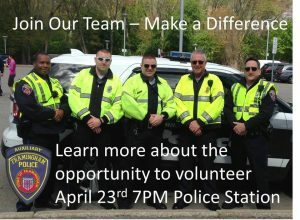 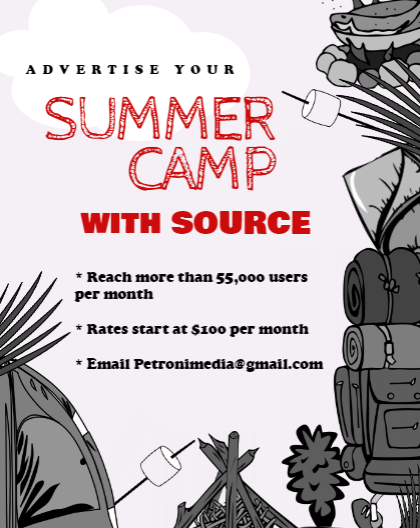 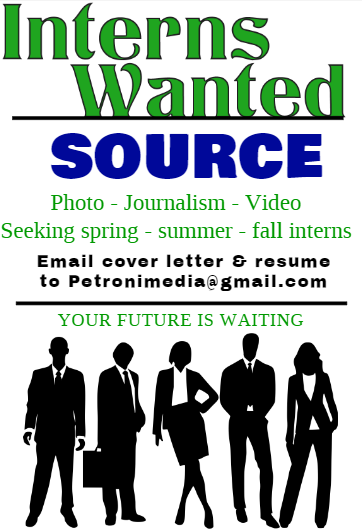 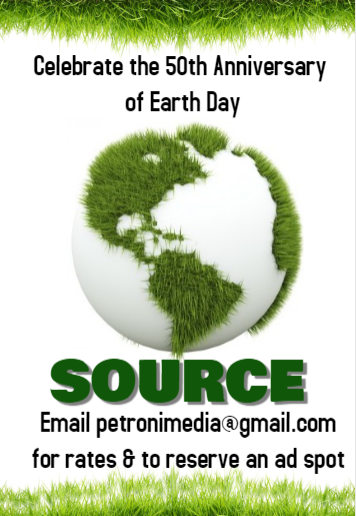 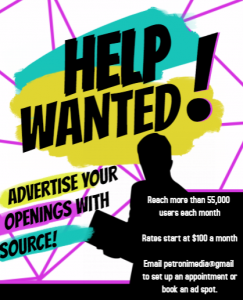 Photos by Petroni Media Company. 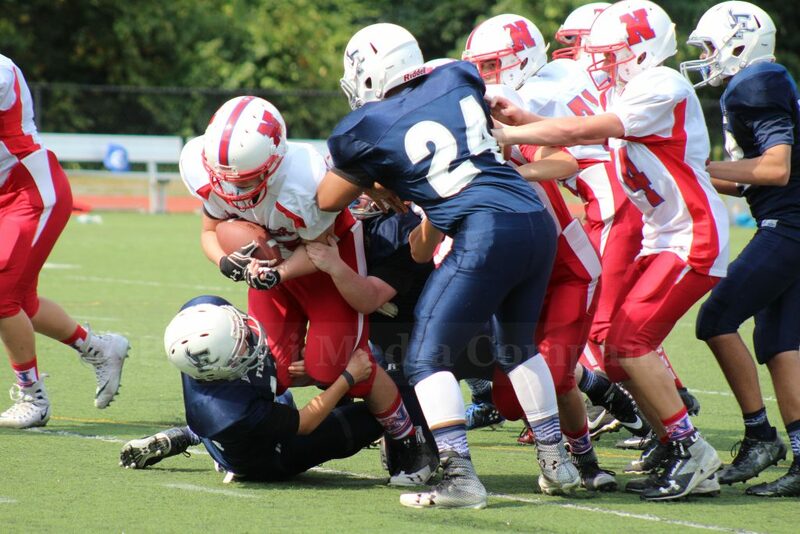 High resolution photos available for purchase.